A nanny from gets a hug from the child she looks after in Brooklyn, New York. Photo by Andrew Lichtenstein/Getty Images. I used to think only the rich hired nannies. That stereotype dominates the media, from a recent New York Times Magazine column on high-priced nannies making more than I ever will in a year, to the new ABC Family reality show, Beverly Hills Nannies, set to debut July 11. Then I had a baby. I’m a freelance writer and editor. My husband is an organizer for a national nonprofit. We have a 4-month-old daughter and live in Brooklyn. We’re not exactly the 1 percent. Yet we have a nanny. Despite recent tales of “super nannies” who make more than their charge’s pediatrician, in many American cities, hiring a nanny costs less than day care enrollment, especially for families with atypical workweeks or multiple kids. A nanny costs so much less than day care in some urban centers that, in my Brooklyn neighborhood, there’s even been a small uptick in private child care hires, despite the sluggish economy, according to exhaustive annual surveys compiled by Park Slope Parents. So why, counter conventional wisdom, is day care actually the more expensive option? First, a day care needs real estate. State and county requirements can include minimum space standards—35 square feet per child is one industry norm—and safety measures such as a ground floor location to meet fire codes. A lot of New York real estate towers above street level, so that already sharply limits options. On our neighborhood’s main drag, commercial rents run $65 to $85 per square foot, according to the 2010 CPEX Retail Report. Most day care providers lie on peripheral streets so they pay less, but even $45 per square foot per month can be steep for a small business. Then there are government-mandated staffing ratios. Massachusetts requires a 1-3 staff-to-infant ratio, or 2 to 7, seven being the maximum number of infants allowed at a single facility. For toddlers age 15 to 32 months, the state allows up to nine children and a staff ratio of 4 to 1 or 9 to 2. So caring for babies means paying more staff with fewer potential clients—toddlers are where the money’s at. For parents, that means precious few Pack ’n’ Plays for their precious little ones. Typical small business costs also apply. Florida’s Department of Children and Families offers sample budget spreadsheets to track day care startup costs, estimating that the overall picture—rent, insurance, snacks, laundry, advertising, office supplies—can add up to $25,000 in initial costs alone in a state with a much lower cost of living than New York City. Hannah Orta, a program specialist for parents and child care providers with the nonprofit Center for Children’s Initiatives in New York City, says that rising gas and food prices also play a huge part in cost increases. Competition does, too. Parents pay a premium for well-regarded child care, just as they would private schools. With few infant spaces, and some parents willing to pay, the costs keep rising. Child Care Aware of America, a child care advocacy group, notes that day care centers face a huge potential turnover rate—33 percent is typical—and so must continue to raise fees in order to retain the experienced staff that parents are looking for. Then there is the upper middle class battle for resources: Some infant programs in New York City have a two-year waiting list, and parents who register after the first trimester of pregnancy may be out of luck, according to a recent Wall Street Journal report. In Brooklyn, there are always tales floating around listservs about parents camping out overnight for day care spaces or applying to five day cares—and not getting in anywhere. Oh, and want to have more than one kid? Every additional child complicates the equation. This isn’t just a New York problem: Meghan Super lives outside of Minneapolis and has five kids ages 11, 9, 3, 2, and 6 months. She works part-time from home and needed child care from 11 a.m. to 3 p.m. for her youngest three. The facility her older children attended when they were young is actually pretty cheap—it would have charged her $10 an hour for the trio, but they didn’t have any infant openings. Super found a large day care center that had infant openings, but that meant driving her kids to different providers and paying a total of $24 an hour. Super’s neighbor runs an in-home day care but charged $50 a day per child, which, since she only needed four hours of care a day, would amount to $12.50 an hour per child, or $37.50 an hour total. Which is a lot! Frustrated, Super turned to an online nanny service and learned the going rate in her area for someone to watch all three kids was only $15 an hour. Finally, a solution. Nannies, of course, have no overhead. The parents supply everything from the home to the toys to the snacks to the diapers, mostly stuff we’re buying anyway. And while most day cares have strict drop-off and pickup policies, the nanny-family arrangement can offer some much-needed flexibility. Take my situation: I have a home office and Mondays off, so we only need about 32 hours of child care a week. The few providers we found who accepted infants charged at least $10 per hour for 40 hours of care, but hourly rates rose when the hours dropped, so our 32 hours might cost the same as a full 40. Most day cares won’t allow you to shift your hours earlier or later or split days (and rightly so: they need to plan for their staff), so even if I had a late assignment and wanted to spend the morning with my kid, that wasn’t an option if I still needed afternoon care. We started exploring the idea of a nanny share—joining with another family to hire a nanny to watch two children. The nanny earns more than if she had just one charge, but each family pays less than if they hired the nanny by themselves. The average hourly wage for a nanny watching two children—be they siblings or a nanny-share arrangement—in our neighborhood runs about $13 to $20, or $6.50 to $10 per child, according to Park Slope Parents, which counts more than 4,000 parents as members, myself included. Nationally, nanny shares remain rare, but PSP surveys find the numbers locally are rising. The last PSP day care survey, in 2009, found many parents paying $19,000 and up for day care. A nanny share can still total around $15,000 a year per family, but the difference buys a lot of diapers. Sharing a nanny in elitist Brooklyn is not that much more expensive, it turns out, than what residents of other parts of the state pay for day care. The previously mentioned Child Care Aware tracks national costs. Average infant day care fees for all of New York state run $13,650 annually. Paying a nanny $15,000 a year isn’t so far from the state average. “It was a no-brainer to go with a nanny,” another Brooklyn mom, Sarah Craft, told me. Craft has an infant and a 3-year-old. The eldest’s day care runs $11 an hour. 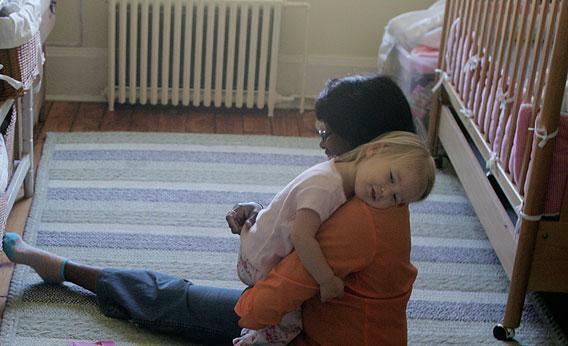 The infant nanny share is $10 an hour, and fewer hours. Infant day care would have charged her from 8 a.m. to 6 p.m., but she only needs 8 a.m. to 4 p.m.
Less money, of course, might mean that nannies should make more, particularly as so many are paid off the books and receive no benefits. But it’s not so easy to pay more: I’ve been a parent all of four months, and already I realize child care costs before kindergarten are more expensive than paying for four years of public college tuition. In-state fees for Binghamton University ran almost $7,000 for the 2011-2012 school year, according to U.S. News and World Report—or less than half the cost of my child care. Tuition and fees for Cornell University are just north of $37,000. By the time my child enters preschool, I will have paid the equivalent of almost two years of an Ivy League education. I don’t begrudge indebted recent graduates and their families the national hand-wringing over college costs. But early child care should be part of the conversation too, especially since so many of us depend on dual incomes. Caring for two children under the age of 5 will cost us the equivalent of an apartment and a half. And I have one of the cheapest options available to an urban working mom. I have a nanny.